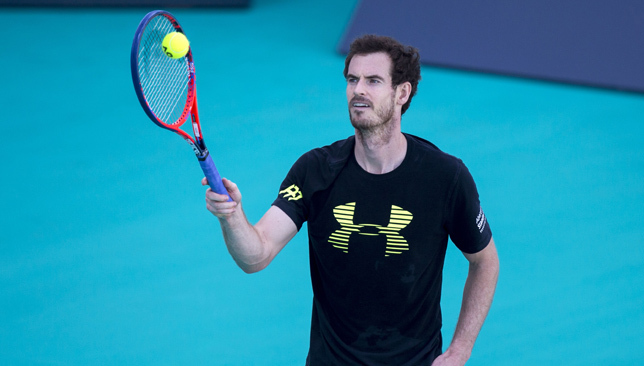 Andy Murray stepped in for Novak Djokovic in Abu Dhabi on Friday. Andy Murray admits there’s still room for improvement following his 6-2 loss in an exhibition set against Roberto Bautista Agut in Abu Dhabi on Friday. The former world No. 1, now down to 16 in the rankings following a six-month hiatus due to hip injury, agreed to play an exhibition set against Bautista Agut after Novak Djokovic was forced to withdraw from the Mubadala World Tennis Championship (MWTC) in Abu Dhabi citing pain in his elbow. Murray looked far from his best, particularly his movement, which has always been one of his greatest assets. His fighting spirit was ever present though as he staved off one break point after the other before finally surrendering. “I felt better as it went along – obviously a bit slow at the start. Roberto is one of the best players in the world and when you haven’t competed for a long while it takes time to get back up to that pace,” Murray said in his brief on-court interview. “I started to feel a bit better towards the end, but I’ll need to keep improving for sure. Murray was a surprise appearance in Abu Dhabi as he flew to the capital on Thursday morning to practice on the courts of Zayed Sports City before he flies to Brisbane where he is due to kick-off his 2018 season. He hit the practice courts with his coach Jamie Delgado on Thursday and Friday before taking on Bautista Agut in the evening. “It’s always difficult to stay out from the circuit a lot of time and then come back and feel okay in five minutes, no? It takes a while. I think he needs to spend more time on the court to get better feelings, like everybody,” said Bautista Agut of Murray’s form. Mubadala World Tennis Championship stars Kevin Anderson and Dominic Thiem have reacted to the news that forced 12-time Grand Slam champion Novak Djokovic to withdraw from the season-opener in Abu Dhabi, before even taking to court. The Serbian great, who last played at Wimbledon back in July, was forced to make the call on his fitness over his troublesome elbow injury, which meant he was unable to take to the court on Friday and face Roberto Bautista Agut in the semi-finals of the event. And with Doha and the Australian Open on the horizon for the former World No.1, this latest setback has cast doubts over his long-term fitness. Speaking after his straight-sets victory over Dominic Thiem to reach Saturday’s final in the UAE capital, South African Anderson said: “If you’re not really feeling healthy, as tough as it is, it’s probably better not to play. Obviously, especially someone like Novak – with his expectations and what he’s achieved in the sport. Watch Novak Djokovic fans react to the news that the 12-time Grand Slam winner was forced to withdraw from the Mubadala World Tennis Championship on Friday due to pain in his elbow. Djokovic, who was due to make his long-awaited return from the sidelines and take to the court in Abu Dhabi for the first time since Wimbledon last July, has now delayed his comeback ahead of next month’s Australian Open.